Photo: Lake Toba is big, very big. A delightful way to enjoy Lake Toba is to rent a motorbike from one of the hundreds of rental places in Tuk-Tuk and just hit the road. 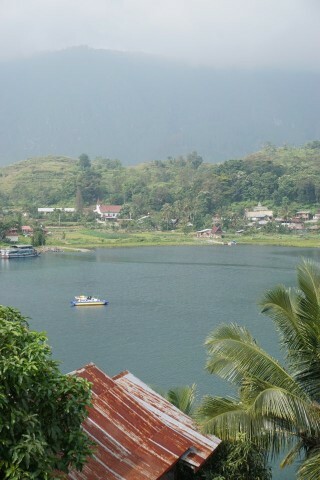 Browse places to stay in Lake Toba on Agoda.com. Free cancellation. If you get on the road early enough, say 07:00, it’s possible to take in all of the sites on the island and make a complete circuit. The western side of the island is completely different to the east, where Tuk-Tuk is located, and it’s worth heading there to experience the stunning views of volcanoes, rice fields and isolated communities. Just south of Tomok, the ring road commences a steep ascent of the mountain, which reaches an altitude of about 1500 metres. It’s quite cool up here and advisable that you have a jacket to keep the cold at bay although many won’t mind the fresh air. For those more adventurous, it’s possible to enter the interior of the island where roads crumble away to dirt and the way of life is more traditional. A favourite stopping point is the bustling village of Dolok where you can refuel your machine, get a bite to eat and even find a place to sleep if it’s getting late. In fact, it’s preferable to stay the night in Dolok if you’re cruising the interior as you may otherwise feel too rushed. You’ll barely see another tourist as you circle the island past Pangururan in an anti-clockwise direction and it’s this part of the island that is ripe for exploration. The scenery, the culture and the people around these parts are all simply stunning. Motorbikes can be rented anywhere for around 80,000 rupiah per day including a tank of fuel with some guesthouses giving a discount for in-house rentals. Be sure to wear a helmet even though locals often don’t – crashes are not uncommon especially in wet weather. The people renting out the motorbikes claim that foreigners are never pulled over for license checks on Pulau Samosir, but just be aware that a valid motorcycle licence as well as international driving permit is required by law in Indonesia. But that doesn’t stop large numbers of tourists renting motorbikes anyway. We can’t emphasise enough how enjoyable cruising Pulau Samosir can be. Browse our independent reviews of places to stay in and around Lake Toba. Read up on where to eat on Lake Toba. Check out our listings of things to do in and around Lake Toba. Read up on how to get to Lake Toba. Planning on riding a scooter in Lake Toba? Please read this. See below for more sights and activities in Lake Toba that are listed on Travelfish.org. Where are you planning on heading to after Lake Toba? Here are some spots commonly visited from here, or click here to see a full destination list for Indonesia.